Billboards could possibly become more than an eye sore in Lima, the capital of Peru. 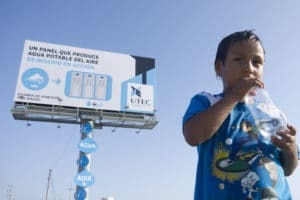 The University of Engineering and Technology of Peru partnered with the ad agency Mayo DraftFCB, to engineer and build the first ever billboard that extracts drinking water from the air. Using an inverse osmosis filtration system, the billboard converts air humidity into potable water generating up to 20 liters a day. The device has already produced 9,450 liters of water (about 2,500 gallons) in just three months, which is equivalent to the monthly consumption of hundreds of families. This could be a godsend for a city located on the coastal deserts of Peru and has an atmospheric humidity of 98% but receives less than half an inch of annual rainfall. This project shows that innovative technology and business creativity can solve everyday social problems. And they apparently achieved their other intended result: attracting future engineers to the university. Current version of this technology appears to take a lot of power. The next step would be to make the system self sustainable. Unitus Ventures (formerly Unitus Seed Fund) is looking for startups with innovative and sustainable solutions that provide the basic necessities that low-income populations need to live and thrive. To learn about our criteria and applying, click here. Selected from an article on Time.